This week the Belarusian Association of Advertisers announced a competition for the best poster in popularising the Belarusian language. They want to draw public attention to "one of the most painful social problems” – the low usage of Belarusian in everyday life in Belarus. Belarusians have the weakest national self-identification in the former Soviet Union and authoritarian ruler Alexander Lukashenka is happy to pursue pro-Moscow cultural policy in exchange for cheap Russian gas and oil. The most recent manifestation of such a policy was a letter from the presidential administration urging local authorities "not to allow artificial reduction of the use of the Russian language". While the authorities are trying to suppress the use of Belarusian, Belarusian civil society is trying to revive it. And for good reason. The Belarusian language was the only official language of the Grand Duchy of Litva (Lithuania) – once the largest state in Central Europe. But in the last two centuries went through very difficult times. Since the late 18th century, Russia tried to assimilate Belarusians into the Russian Empire. Mikhail Muravyov who led Russia's administration in the Belarusian territory in the 19th century, famously said: "What Russian rifles did not succeed in doing, will be finished off by Russian schools". The modern Belarusian national movement developed relatively late – in the 19th century and in less favourable conditions compared to Baltic states or Ukraine. In 1920 there was a brief period of "Belarusification" in the Soviet Union. Repressive Stalinist totalitarianism ended this short-lived policy and damaged Belarus more than other Soviet republic. Post-Stalin Soviet leaders continued this policy. Nikita Khrushchev during his visit to Minsk in 1959 stated: “The sooner we all speak in Russian, the faster we build communism”. Belarus occupied the last place among all Soviet republics according to the use of its native language. And still it was higher then than today. In 1950, the majority of Minsk residents spoke Belarusian. In 1970, almost 40 per cent of books and newspapers in Belarus were published in Belarusian. Already in 1984, only 5 per cent of newspapers in Soviet Belarus circulated in the Belarusian language. After the declaration of independence in 1990, the Belarusian Parliament proclaimed the sole official language of the country. But the first Belarusian president Alexander Lukashenka was unable to speak either proper Russian, or Belarusian. He spoke a mixture of the two languages with a heavy Belarusian accent. However, he decided to position himself as the defender of the Russian language from Belarusian nationalists. Lukashenka also portrayed the Belarusian language as a real threat to Russians in Belarus. Since the 1990s, the myth of "Belarusian nationalists" has been helping him gain political and economic support from Moscow. Following a questionable referendum in 1995, Lukashenka made Russian the second official language in Belarus. Russian president Boris Yeltsin was thankful and surprised with the result: “Just think of it! They have even made Russian official!". Lukashenka rarely speaks Belarusian. When he does so, his main goal is usually to ridicule his political opponents. There was no place for the Belarusian language in the newly created state ideology based on the glorification of the Soviet past. Under the 18 years of Lukashenka's rule, education and schooling in the Belarusian language had been marginalised. In 1994, 75 per cent of Belarusian children went to schools with Belarusian as the language of instruction. Today, it's less then 20 per cent. This figure is based primarily on rural schools which are gradually dying out. For comparison, only 2 per cent of pupils study in Belarusian-speaking classes and schools in Minsk, and only several children do so in the town of Mahilou with a population 360,000. Many Belarusian parents refuse to send their children to the Belarusian-language classes simply because they do not think it would be useful for them in the future. In spite of the appeals from civil society, the authorities did not allow the establishment of even one college or university with Belarusian as the principal language of instruction. Belarusian is almost never used in official communication and office administration. Most of the state-owned mass media broadcast in Russian. Moreover, often people are just afraid to speak Belarusian publicly. The reason is Belarusian-speaking people used to be the primary target of police and KGB during the opposition street protests. That is why statistics demonstrate decreasing use of the Belarusian language. If in 1999 there were 36.7 per cent who claimed they spoke Belarusian every day, in 2009 it had dropped to 23.4 per cent. Official Minsk has been trading its pro-Russian cultural policy for oil and gas loans for years. These tactics were slightly modified during the cooling down period with Russia and a thaw with Brussels in 2007-2010. In 2008, Lukashenka appointed “the first Belarusian speaking minister”. Pavel Latushka, Belarus' Minister of Culture, is the first high-ranking Lukashenka’s official who predominantly uses Belarusian even in official communication. However, the state policy to reinforce Belarusian national identity remains poorly articulated and very inconsistent. The Belarusian media recently published a letter from Alexander Radzkou, a senior official in the presidential administration. The letter instructs regional and local authorities “to take concrete measures to prevent the policy of forced Belarusification by heads of state bodies and other organisations and the artificial limitation of the use of the Russian language in their activities." The vast majority of the population has no problem with understanding Belarusian even if they struggle to speak it fluently. Today Belarusian is the language of the intelligentsia, creative elites and young city dwellers. Many world famous brands have staged a range of successful advertising campaigns in Belarusian. It has proven that the Belarusian language has huge potential to affect people. But its prestige and wider use need to be supported. 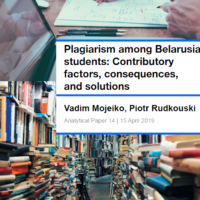 Some western policymakers elaborating strategies to democratise Belarus neglect the importance of the Belarusian language. They forget that Belarusian had been the basis for the original Belarusian national movement and statehood based on democratic ideas. It brought together people of different faiths and ethnic origins. As David Marples noted in 1999, “For Belarus, national development without the native language, especially under the shadow of a much larger Slavic neighbour with a lengthy historical tradition as an empire, was virtually impossible”. And it is still not possible today. Being the cornerstone of Belarusian identity, Belarusian language protects the nation from Russian expansion and Russification. On the other hand, Belarusian makes Belarusians feel European. It is a very important tool for democratisation. That is why, if the West does not want to “lose” Belarus to Russia completely, it should help Belarusians strengthen their national self-identification and to feel themselves to be a part of a greater European heritage. The Belarusian language as the cornerstone of the nation should definitely be supported alongside democratic values and human rights, as Kenneth Yalowitz, the US ambassador to Belarus, noted recently.